Biopharmaceutical Processing: Development, Design, and Implementation of Manufacturing Processes covers bioprocessing from cell line development to bulk drug substances. The methods and strategies described are essential learning for every scientist, engineer or manager in the biopharmaceutical and vaccines industry. 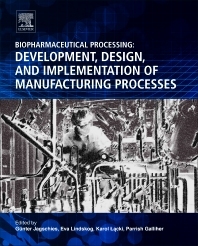 The integrity of the bioprocess ultimately determines the quality of the product in the biotherapeutics arena, and this book covers every stage including all technologies related to downstream purification and upstream processing fields. Economic considerations are included throughout, with recommendations for lowering costs and improving efficiencies. Designed for quick reference and easy accessibility of facts, calculations and guidelines, this book is an essential tool for industrial scientists and managers in the biopharmaceutical industry. Dr. Jagschies is a 30-plus year employee at GE Healthcare Life Sciences and a globally recognized expert in bioprocessing. He has published numerous papers and two books on the development, manufacturing and economics of biotherapeutics, and in 2012 he received the BioProcess International award “Thought Leader of the Decade”. Dr. Lindskog has degrees in chemical engineering and bioprocess technology. She has been working across the biopharmaceutical process, with a focus on innovation in upstream technology. Dr. Lacki’s educational background is in process and chemical engineering, and he is heavily involved in R&D projects related to chromatography media development, process development and validation, and facility design. Mr. Galliher is co-inventor on numerous patents in the field of biomanufacturing. In 2012, he received the BioProcess International Award as “Thought Leader of the Decade” in the Upstream Processing category. I received the book yesterday. I am very satisfied with the contents of it and prompt transportation.